GENEVA (Reuters) - Military and government officials in Myanmar have waged a "political campaign" to quash independent journalism, arresting and prosecuting many through the use of vague and overly broad laws, the U.N. human rights office said on Tuesday. 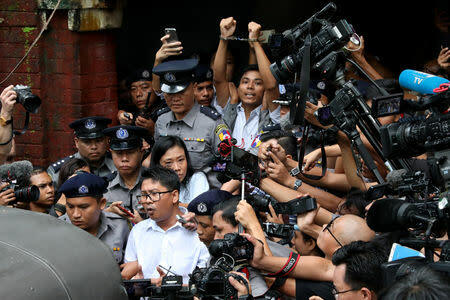 The U.N. report called it a "particularly outrageous and high-profile example of judicial harassment against the media in Myanmar" and illustrative of how arrests and prosecutions are conducted "in violation of the right to freedom of expression". "The report refers to the 'instrumentalization of the law and of the courts by the Government and the military in what constitutes a political campaign against independent journalism'," U.N. human rights spokeswoman Ravina Shamdasani told a Geneva briefing. The U.N. report entitled "The Invisible Boundary - Criminal prosecutions of journalism in Myanmar", which examined freedom of the press since Suu Kyi's National League for Democracy (NLD) came to power in 2015, said it had become "impossible for journalists do to their job without fear or favor".